Perna Perna St Lucia - St Lucia Accommodation. Perna Perna offers comfortable and secure spacious 2 bedroom, 2 bathroom apartments with lounge, dining and kitchen. The main air-conditioned bedroom with Queen size bed and small sitting room overlooking either the garden or pool. The second bedroom consist of 2 single beds. 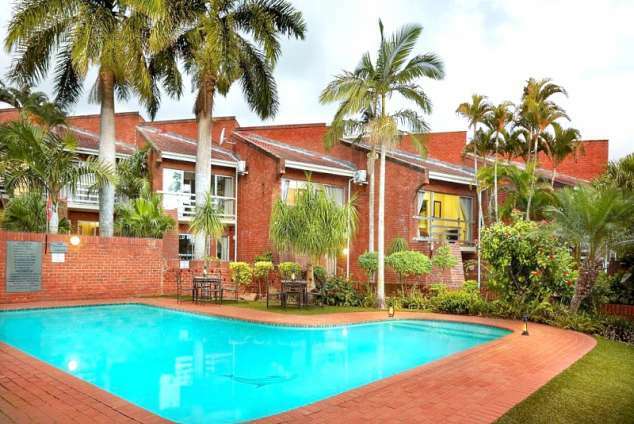 Each apartment is fully equipped, serviced daily and offers DSTV, ceiling fans in every room, private lock up garage, private patio with BBQ/Braai as well as swimming pool and children’s play area. Perna Perna is within walking distance to shops and restaurants in the main quaint street of St Lucia making your stay stress free and relaxing. This spacious and welcoming two bedroom apartment is an ideal base for couples or families to explore the area. The unit comes fully equipped with a complimentary daily cleaning service, it includes a comfortable lounge, kitchen and dining area and also has a terrace with private BBQ/braai. The main bedroom has a queen size bed, air-con and lots of storage/cupboard space. It also has a TV and a small private sitting area to relax. The second bedroom has two single beds, ceiling fan and ample storage/cupboard space. This duplex apartment has two bathrooms. The first bathroom has a bath with overhead shower, toilet and basin. The second bathroom has a shower, toilet and basin. This apartment is on the ground floor and is suitable for a person using a walking aid, but not suitable for a wheelchair. This 3 bedroom, spacious self-catering apartment is ideal for families as a base to explore the area. The unit has a private charcoal braai area for guests to enjoy. The main bedroom has a queen size bed sleeping 2 and the second and third bedrooms both have two single beds. The apartment has two bathrooms. Both bathrooms have a bath, shower, toilet and basin. This apartment is on the first floor and is suitable for a person using a walking aid, but not suitable for a wheelchair. It is situated independently and not adjacent to other units. Perna Perna St Lucia is set in the heart of St Lucia, walking distance to all local shops and restaurants. The holiday units are fully equipped and serviced daily to ensure a stress free stay. In addition to being a habitat for Nile Crocodiles, Hippo, Rhino, Buffalo, Leopard and Elephant, St Lucia also boasts a host of water birds including Pelicans, Kingfishers, Geese, Ducks, Heron, Fish Eagles, and Storks. Lake St Lucia´s eastern shores are comprised of some of the highest forested dunes in the world. Whatever you choose to do a stay at Perna Perna St Lucia Resort is sure to re charge your batteries in this beautiful part of South Africa. Take N12 to Witbank, turn off to Ogies. Go through Bethal, Ermelo, Piet Retief, Pongola. Continue south along the N2, past Mkuze and Hluhluwe. Take turn-off left to Mtubatuba and St Lucia signboard, the R618. As you arrive in Mtubatuba, turn left to St Lucia +- 28 km's. Take N2 north, to Richards Bay, turn right at Mtubatuba intersection towards Mtubatuba, the R618. A Caltex service station will be on the left, next to the N2. At T-junction turn left and then take the 2nd road to the right to St Lucia +- 28 km's. Find Perna Perna St Lucia on left hand side opposite Manzini Chalets. 498 page views since 07 Nov, 2018.